The readers have spoken. 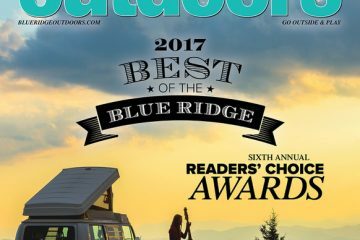 After more than 85,000 votes over the course of six weeks, we have our 2017 Best of the Blue Ridge winners and favorites. Carter Caves State Park, Olive Hill, Ky.
Mostly recognized for its impressive cavern system, Carter Caves in eastern Kentucky has equally majestic assets aboveground, too. Some 26 miles of multiuse trails weave across the park’s 2,000 acres, which include seven natural bridges, the 45-acre Smokey Lake, and countless sinkholes, waterfalls, and box canyons. Experience the beauty and history of the park via the Carter Caves Cross Country Trail, an 8.3-mile trail that passes across two suspension bridges and beneath unique sandstone formations. Appalachian Trail thru-hikers often gripe and groan about the “green tunnel” that is the A.T., but Roan Mountain makes up for all of those long canopied miles with its expansive views and grassy balds. Situated on the literal border between North Carolina and Tennessee, the massif is home to a number of peaks 5,500 feet in elevation or higher. Because of this, hiking Roan’s balds is about the closest you can get to an above-treeline alpine trekking experience—spruce fir trees, rhododendron gardens, and ample amounts of snow turn this southern Appalachian anomaly into an arctic-like landscape come wintertime. 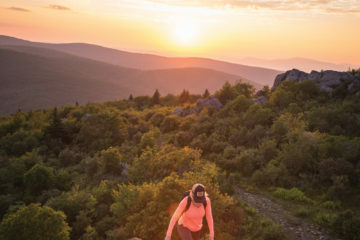 “No matter what visitors like to do, the Roan Highlands can accommodate any kind of adventure seeker,” says Carter County Tourism Coordinator Kayla Carter. So if you’re not a hiker, she says, try, “birding, skiing, disc golf, and some beginner mountain biking trails at Roan Mountain State Park just down the road.” Roan Mountain is a one-stop-shop for adventure. Skinny Dip Falls, Canton, N.C.
We wouldn’t recommend actually skinny dipping here—over the years, this easily accessible swimming hole off of the Blue Ridge Parkway (milepost 417) has garnered quite a crowd of weekend loyalists. But if you’re in the market for a cool soak on a hot day, even if you have to share the splendor, these falls are unrivaled. Behind the vibrant and otherwise urban cityscape of Roanoke rises the profile of Mill Mountain, the Star City’s highest point (1,703 feet). The summit, which is part of Mill Mountain Park, is a destination for tourists and an escape for the city’s residents—10 miles of multipurpose trails trickle down on either side of the mountain, linking back to Roanoke’s extensive greenway system. Runners can literally tie their shoes, step out the door, and be on Mill Mountain’s trails in a matter of minutes. Trails here range from moderately graded paths to technical, rocky singletrack. At the very heart of whitewater paddling in the Southeast flows the Nantahala. Generations of paddlers, some of the best in the world, grew up along the banks of this western North Carolina classic. For intermediate paddlers, the Nantahala’s class II+ stair-step sections are ideal for building river running skills like ferrying and surfing. Most recently, the Nantahala was thrown into the international spotlight when it served as the stage for the Freestyle Kayaking World Championships in 2013. Red River Gorge, Slade, Ky. Newcomers to the Red might be struck by the oddity of seeing hundreds of elite climbers from around the world congregating at a one-room pizza shop in middle-of-nowhere eastern Kentucky. But as anyone familiar with the quality and diversity of climbing in the Red can tell you, finding yourself across the table from Chris Sharma-level climbers with a slice of pie and a cold one is standard fare here. You may even get to bear witness to headline-worthy projects, like Michaela Kiersch’s ascent of Lucifer, a 5.14c. Greenbrier River Campground, Alderson, W.Va.
For riverside camping, quiet evenings by the campfire, and a family friendly atmosphere, look no further than Greenbrier’s eight-acre campground. Campers here can literally pick and choose every aspect of their getaway—maybe you want to rough it in a tent, indulge in a cabin, or go vintage with a renovated ’64 Shasta camper? On the water, perhaps it’s a relaxing class I float-and-fish or a fully equipped class III kayaking excursion you’re after? Whatever your weekend escape, Greenbrier provides. Jackrabbit Mountain Bike and Hiking Trail, Hayesville, N.C. Surrounded on three sides by the still waters of Lake Chatuge, the 15-mile Jackrabbit trail system is unlike any other mountain bike destination in the region. The stacked-loop design takes advantage of the system’s peninsular setting, meandering high along ridge tops and down low near the lake. 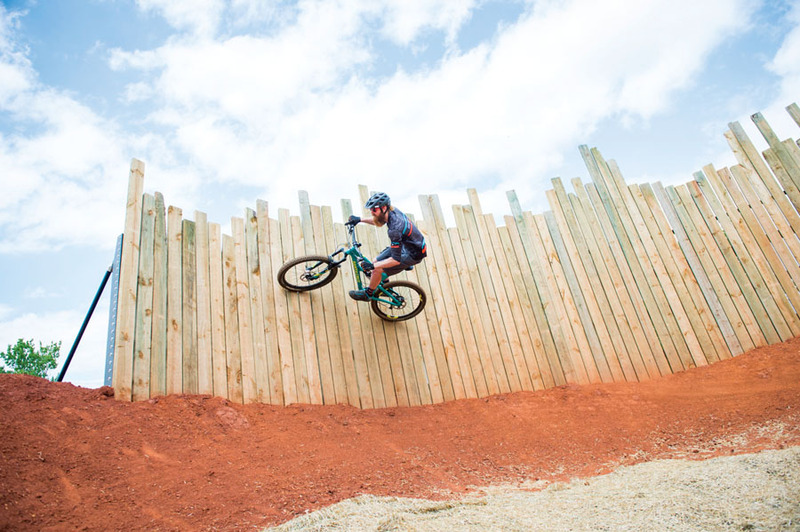 Take the 3.1-mile Central Loop to get a taste of these machine constructed trails. Like what you find? Add on mile-by-mile in a challenge-by-choice fashion. Knoxville Urban Wilderness, Knoxville, TN. Cruising along the 50 miles of trails embedded in Knoxville’s Urban Wilderness, it’s easy to forget that you’re just three miles from downtown. That’s just how the city wants it. Accessible, seamless, and challenging for novice recreationalists and experts alike, the Urban Wilderness is a textbook example of city planning done right. Knoxville-area residents have literal backdoor access to 50 miles of trails, including the 100-acre Baker Creek Preserve, where an additional 7.1 miles of trail, including the Bell Helmets $100,000 expert downhill trail, were recently completed. Cupp Run, Snowshoe Mountain Resort, W.Va.
Shay’s Revenge, Snowshoe Mountain Resort, W.Va. Designed by three-time gold medalist Olympian skier Jean-Claude Killy, Cupp Run is what other East Coast ski runs wish they could be. In just 1.5 miles, Cupp Run drops 1,500 vertical feet, so if you’re feeling a little puckered by the end of it all, that’s par for the course. Snowshoe Mountain Resort, Snowshoe, W.Va.
Few resorts in the Mid-Atlantic offer the sheer number of terrain options that Snowshoe provides. In the Snowshoe Basin Area alone, beginners and intermediates alike can choose between the Progression Session Park, which has small and medium features, or the Evolution Park, which showcases mostly medium-sized walls, down tubes, and barrier rails. Ramp it up on any one of Silver Creek Area’s three Mountaineer Parks, which give riders the full enchilada of small-to-big stuff for every shredding palate. Who wouldn’t want to spend a day paddling pristine, deep-blue waters amid the undeveloped majesty of Great Smoky Mountains National Park and Nantahala National Forest? Over 11,700 acres in size, it’s no surprise to us that Fontana Lake took top marks among our readers. Throw a rod and reel (and your North Carolina fishing license) onto your board for a multisport day on the water. Standing proud above the Linn Cove Viaduct, Grandfather Mountain is practically the poster child for the Blue Ridge Parkway. This section of the parkway is the most photographed spot along the road’s 469 miles. At 5,946 feet in elevation, the mountain is estimated to be 300 million years old and as such, offers visitors a rare glimpse into the sensitive and unique environment that is southern Appalachia. Parkway-goers can take a jaunt up Grandfather via the Daniel Boone Scout Trail, but for the Mile High Swinging Bridge, environmental wildlife habitats, and quick access to the cables-and-ladders trails for which Grandfather is known, head into the Grandfather Mountain Nature Preserve one mile south of the Blue Ridge Parkway at Milepost 305. Both the power and serenity of Cumberland Falls easily make it one of the wonders of this region. Here, the Cumberland River drops abruptly, creating a curtain of water stretching 125 feet across and 65 feet high. For the best view of Cumberland Falls, check out the Eagle Falls Trail. Only 1.5 miles in length, this hike can be deceptively challenging when rain raises the water level and turns seasonally dry creek beds into formidable streams. Want to get down to the falls for a swim? The half-mile Cumberland Falls Trail descends 200 feet down to the river’s edge but can be extremely crowded in the warmer months. For unparalleled exposure, tough terrain, and jaw-dropping beauty, look no further than the Linville Gorge. The gorge itself extends for 12 miles down the length of the mighty Linville River, which roars some 2,000 feet below Linville’s highest point, Hawksbill Mountain, at 4,009 feet. 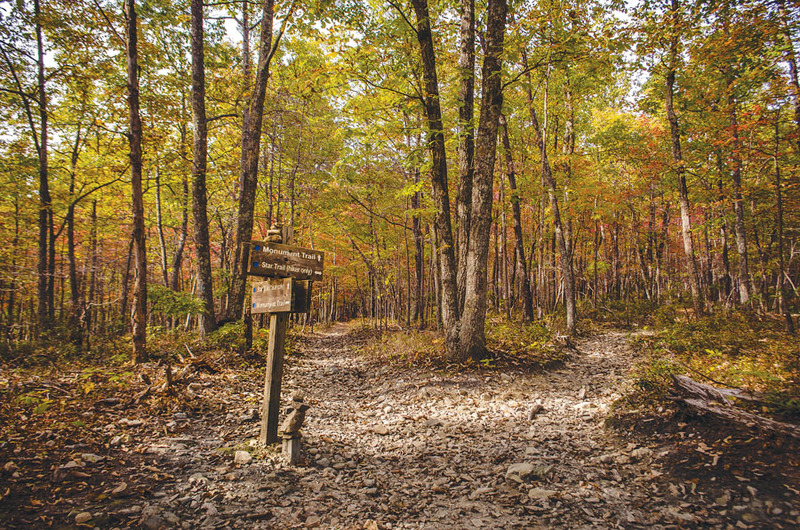 There are some 40 miles of documented trails in the Linville Gorge, but the diehard off-trail adventure community that surrounds this special place would beg to differ. Big South Fork Scenic Railway, Stearns, Ky.
Pisgah Center for Wildlife Education, N.C.
All aboard! History, and nature, never looked so cool. During warmer months, kids are encouraged to explore the Blue Heron Mining Camp, a National Park interpretive site intended to preserve the Big South Fork’s industrious past in coal and lumber. In the winter, the train is adorned in Christmas decorations for its annual South Fork Santa Express. It’s like the Polar Express, except a little farther south. Jackrabbit Mountain Bike and Hiking Trail System, Hayesville, N.C.
You could bring your cat-on-a-leash, or iguana, or ferret. Jackrabbit Mountain doesn’t discriminate. But generally speaking, trail-loving hounds are what you’ll find here. The fast and flowy trails aren’t too steep or rugged, and with the stacked-loop design, you can go as long or as short as your furry friend can handle. Just be sure s/he stays out of the designated swimming area. It may come as a surprise to many that the Star City, once regularly listed in the top 10 places to retire, has attracted a fresh wave of vitality centered on culture, community, and especially, the great outdoors. For us, it’s hardly a surprise. After all, Roanoke has won our annual Top Adventure Towns contest three separate years. For those of you unfamiliar with Roanoke, here are just a few of the reasons you should uproot your life tomorrow and move to Virginia’s Blue Ridge—vibrant nightlife, diverse restaurant scene, ample breweries, literal backdoor access to biking and hiking trails, affordable cost of living, four distinct seasons, bike commuter friendliness, and quite simply, the people. With that type of energy, you won’t stay single for long. Touché, readers. We’ll keep your little secret…for now. For a city of nearly 100,000, Roanoke certainly knows how to interweave its green spaces into an urban landscape. There are 30 miles of paved greenway connecting neighborhoods to downtown districts, parks, and the Roanoke River. Additionally, greenway users can connect directly to Mill Mountain Park, where another 10 miles of multiuse trails await. Couple all of that with the city’s 70 park properties and wide offering of youth clubs like the East Coasters Junior Mountain Bike Team and the River Rock Youth Climbing Program and what do you have? A supportive and inclusive community committed to fostering an appreciation for the outdoors in our children. Bent Creek Experimental Forest, N.C.
Prime time for casting in this surprisingly large creek is springtime, but just about any time of the year will reward you with spectacular solitude, scenery, and wild trout fishing. The majority of anglers that do fish here will try their hand in the stocked portion downstream, but just upstream of the Fires Creek picnic area is an idyllic, and mostly overlooked, gorge. Don’t come here expecting to land a lunker on your first cast—the trout here are wily and attentive. Stay low and move slow. Engulfed by the stunning mountains of western North Carolina, Lake Chatuge is a destination unto its own. For flatwater paddling, the 130 miles of shoreline create countless adventures, be it swimming or fishing. Camping is available at a number of sites should you decide to dive deep for a weekend (which, we highly recommend). The Omni Grove Park Inn, N.C. Guests at The Greenbrier are often astounded by the resort’s picturesque location amid the Allegheny Mountains. For over 230 years, travelers have journeyed to The Greenbrier for the restorative effect not only of the mountain air but also the white sulphur spring water on which the resort’s mineral spa prides itself. While visitors here can of course indulge in other resort-like amenities, such as the casino, golf course, and bowling alley, we recommend checking out one of The Greenbrier’s daily(ish) guided hikes, canopy tours, or bike outings along The Greenbrier River Trail. With over 11,000 acres to explore on the property, you won’t be bored. When out-of-towners talk about West Virginia, there’s usually one stereotype that emerges—that of the hillbilly. We’ve got news for you, folks. West Virginia has been breeding passionate, mountain-loving activists and athletes for generations, and it’s these very people you can thank for hand sculpting the state’s crumbling communities into recreation paradises. Take the sister towns of Davis and Thomas, for example—in a single weekend you can crush your quads on any number of Tucker County’s 200+ miles of hiking and biking trails, indulge your appetite for pow at four different ski areas, and sample craft beers from the county’s three breweries. Need more convincing? How about Fayetteville, home of the New River Gorge—you can be paddling internationally renowned class IV-V whitewater on the New or Gauley Rivers one day, climbing or bouldering quality rock of equal reputation the next, and capping it all off with gourmet, locally inspired food. And unless you’re in town for Bridge Day or Gauley Fest, you’ll likely have the place to yourself.